KitchenAid dishwashers have control panels with indicator lights for various cycle selections and status information. If an indicator light is illuminated, the corresponding cycle has usually been selected or the cycle is currently at the indicated point, such as "Washing" or "Clean." However, if the "Heavy Duty" and "Normal" lights are flashing alternatively, an error has occurred that requires some attention. Sometimes the "Heavy Duty" and "Normal" lights will flash when an error has been detected, but a simple reset is all that is needed. Unplug the KitchenAid dishwasher and wait two minutes and then return power to the machine. Open and close the dishwasher door firmly and select a new wash cycle, followed by "Start." The lights on the dishwasher may blink alternatively if there is an error with the control panel. Try wiping the control keypad with a clean, damp cloth to remove residue that might be causing the key pads to stick. Follow by drying the key pad. Sometimes a reset as described previously can also resolve problems with a control panel communication error. Although the reason why the "Heavy Duty" and "Normal" lights are both flashing is likely a control panel issue, there are some basic troubleshooting methods that may resolve the problem without service assistance. Try running hot water at the kitchen sink to warm up water before the water enters the dishwasher and run a "Rinse Only" cycle. 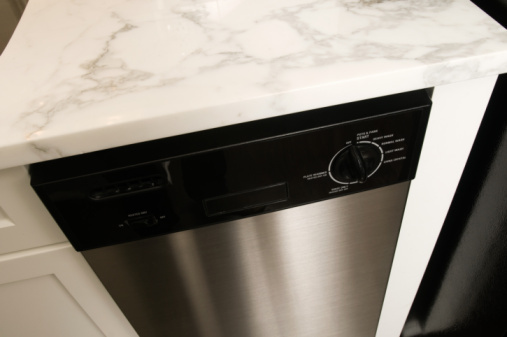 If the error code persists, a water pressure gauge can be attached to the water valve attached to the dishwasher to verify if the water pressure if 120 psi or greater. If the water pressure is less than 120 psi, a plumber can be contacted for assistance. Look inside the bottom of the dishwasher and clean off the overfill protection float, which looks like a small cone, and push on the float to make sure the float moves easily. If none of the troubleshooting methods clear the blinking lights, additional service is needed. If performing a reset does not stop the "Heavy Duty" and "Normal" lights from flashing, troubleshooting efforts did not fix the problem, and you are not comfortable with testing the water pressure with a gauge, do not attempt to check the water pressure on your own. Contact KitchenAid for assistance and let them know that the control panel is likely in need of replacement.